A natural reaction in the form of a smile, either external or internal, occurs whenever anyone encounters a piece of art by Alexander Calder. His sculptural forms are that pleasurably visceral. Creatively original, he set modern sculpture apart from abstract painting and figurative sculpture. He invented the sculptural forms of the mobile and the stabile. For decades his sculpture has been called wonderfully whimsical, delicately balanced and visually in-motion. But the works of Alexander Calder (1898-1976) are much, much more. Currently, in a superb exhibit at the Peabody Essex Museum (PEM), 40 of Calder’s signature sculptures celebrate this 20th Century abstract formgiver master. This is the first comprehensive show in the Boston area in decades. So, this PEM exhibition is a long awaited delight. Alexander “Sandy” Calder was born into an artistic family in Lawnton, PA. His father, Stirling Calder was a well-known figurative sculptor who created many public works mostly in and around Philadelphia. His namesake grandfather, sculptor Alexander Milne Calder is best known for the giant statue of William Penn on Philadelphia’s City Hall tower. His mother, Nanette Lederer Calder, was a portrait artist, and his sister Margeret Calder Hayes was a founder of the UC Berkeley Art Museum. First to Arizona and then to California, the family moved West in the early 1900s. They returned to Philadelphia in 1909, and after a brief stay, moved to Croton-on-Hudson, NY and then to The Bronx. All during his high school years, the Calders moved back and forth between New York and California. In each location, Sandy was given basement space for his own studio. 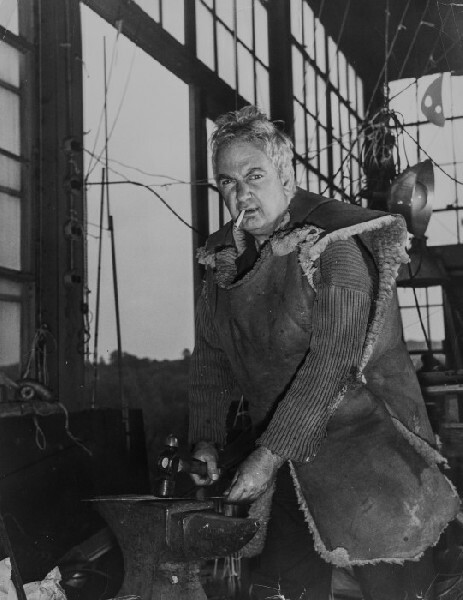 In 1919, he graduated from Stevens Institute of Technology in Hoboken, NJ with a degree in mechanical engineering. Over the next few years, he held a variety of engineering jobs. Inspired by the beautiful scenery while working in the Pacific Northwest, Calder decided to move back to New York to pursue a career as an artist. He enrolled at the Art Students’ League and briefly studied painting and drawing with Thomas Hart Benton, George Luks and John Sloane. To earn money, he worked for the National Police Gazette as an illustrator. On an assignment in 1925, he sketched the Ringling Brothers and the Barnum and Bailey Circus. This led to a fascination for the circus that would appear later in his work. 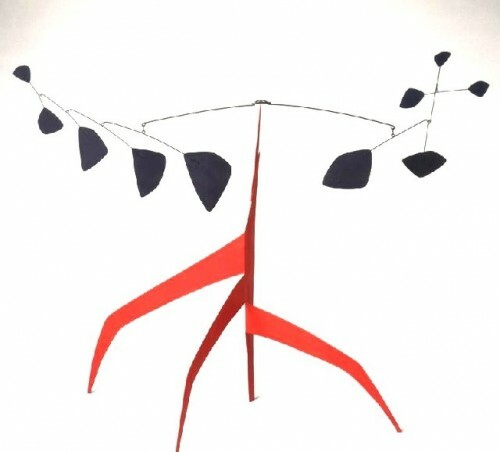 Initially Calder was a figurative painter, but in 1926, he moved to Paris. His medium of expression changed after he was introduced to and became friends with Piet Mondrian, Joan Miro, Jean Arp and Marcel Duchamp. Mondrian’s spare geometric approach to total abstraction intrigued him, and the organic shapes in Arp and Miro artworks influenced his work as well. When he first created mobiles, it was Duchamp who actually named the form. “Mobile” in French means both “motive’ and “a moving object.” So the appellation was totally appropriate for Calder’s distinctive sculptures. Returning with his wife Louise (William and Henry James’ grandniece) to America in 1933, the couple bought a farmhouse as a home and studio in Roxbury, Connecticut. Three decades later in 1962, Calder settled in a new studio/workshop in Indre-et-Loire, France. In this later studio, he worked the rest of his life. In 1926, the artist began to make toys. This led to his well-loved Cirque Calder, a miniature circus made out of wire, string, rubber, cloth and found objects that was designed to fit into suitcases. A favorite of the avant-garde, Calder gave performances of the circus on both sides of the Atlantic. It is often on view at the Whitney Museum of American Art. After returning to the US in 1927, he was contracted by the Gould Manufacturing Company of Oshkosh, Wisconsin to create for mass consumption children’s kinetic wooden push/pull toys. The originals and playable models are on display at the Berkshire Museum in Pittsfield, MA. Also, The Pittsfield Museum gave Calder his first public commission. Two mobiles were created for the museum’s theatre. 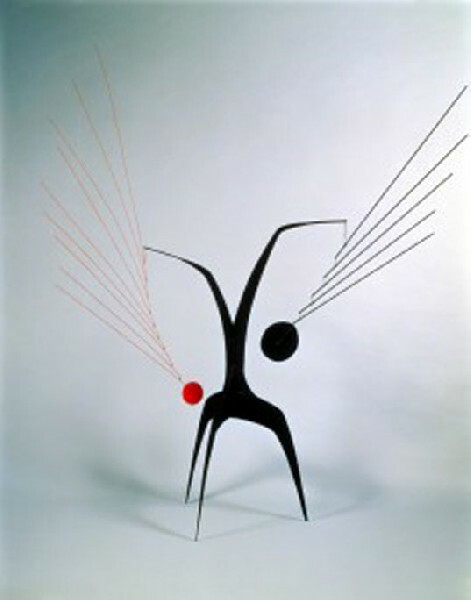 It was in 1931 artist Marcel Duchamp suggested to Calder that he call his new kinetic sculptures “mobiles.” Around this time and during the subsequent decades, Calder developed a range of kinetic possibilities in his mobiles which allowed him to go beyond the representational and static of traditional sculpture. His creativity was in the how and where he connected and balanced and counterbalanced the shaped elements. These in turn influenced the mobiles’ movements and individual parts in relationship to the whole arrangement of the artworks themselves. 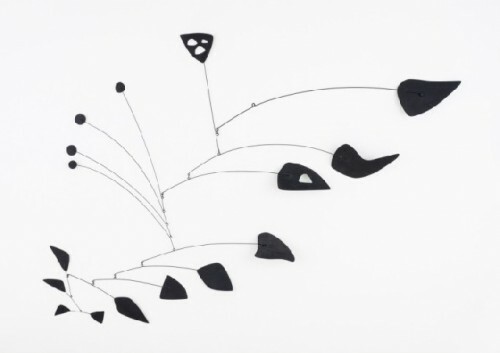 For Calder’s pieces, the whole was always greater than the sum of its parts. This is what is so effecting to our perception of Calder’s work. Looking closely at a suspended or standing mobile from different vantage points, it is the variety and variability of its form and movement that aesthetically challenges and delights. Always experimenting and tinkering, the artist made his first outdoor sculpture in 1934 in his Roxbury, CT studio. First using the same materials as his smaller indoor pieces, he soon realized that the earliest standing mobiles were too delicate for moderate to strong winds, and he needed to radically redefine his fabrication methods. Just making a sculpture larger didn’t work. Larger meant addressing other meaningful variables in its resolution. In 1936, he changed his working methods by creating smaller scale maquettes that could be enlarged to monumental size. To him, rather than just a rougher model for the larger finished piece, Calder considered each one a sculpture in its own right. Drawing designs on brown craft paper, he would then enlarge them using a grid. As with any evolving artwork, while creating to his exact specifications, he also would adjust or correct a shape or strategic line as the piece was enlarged. During the 1950s and 60s, he focused upon monumental works. His numerous commissions for museum plazas, corporate headquarters and government buildings are sprinkled throughout the world. Under his strict supervision, his monumental stabiles would be scaled up by fabricators and made primarily of ¼” carbon steel sheet metal. They would then be industrially painted in black or bright colors, often in his signature Calder Red, a warm, rich Cadmium red. His largest mobiles are fabricated out of aluminum along with airplane wire and lead alloys. 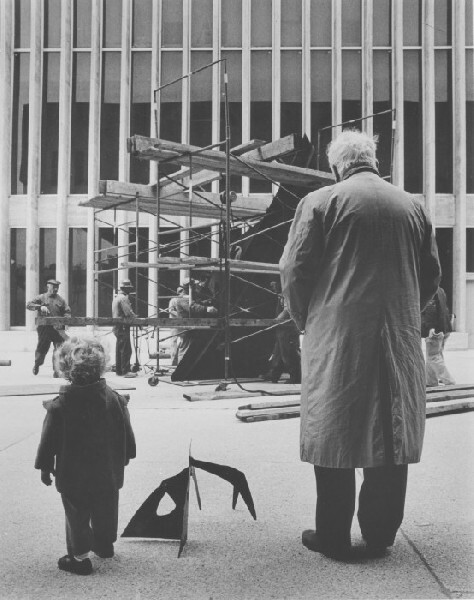 Calder’s 1969 monumental stabile La Grande Vitesse in Grand Rapids, Michigan was the first civic sculpture funded by the National Endowment of the Arts. This was a superb choice as an inaugural commission. 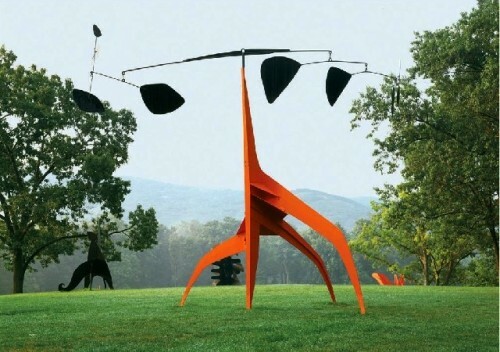 Redefining what modern sculpture was, Calder produced site-specific stabiles continually until his sudden death in 1976. Though not formulaic, in every piece that Calder did, there are ingredients that were very much his own creative signature. Each had a sense of poetic whimsy brought forth by an elegance of form. Often spare, but always, even with the stabiles, there was an evocation of motion, a sense of graceful spatial recognition in each of his pieces of art. Though visually related, his artistic statements are all unique, each speaking to us in its own visual phrasing, often moving or shaped in unexpected ways. They transcendently encourage a parallel deep sense of wonder and delight in the viewer. The PEM Alexander Calder show is truly a visual treat. 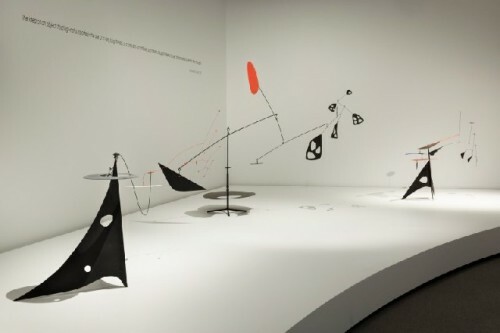 This exhibit is a panorama of Calder’s work stretching between the early 1930s and the late 1960s. 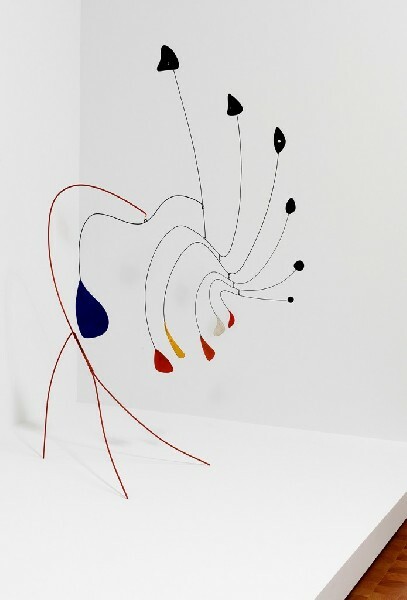 Organized by the Los Angeles County Museum of Art (LACMA) in cooperation with the Calder Foundation, New York, it is a sensational overview of this great artist’s contribution to modern art and his strategically revolutionary approach to sculpture. Calder liberated sculpture from pedestals. Using an original visual vocabulary and structural as well as conceptual framework, he even freed it from the ground. Through form, line, volume and spatial relationships, he pushed the capacity to explore pure abstraction in a physically poetic way. With strategic use of color, he added another layer of perception. There is always a charm to Calder’s work. Part of it is the surprise or chance expectation of each piece. His elegantly curvilinear constructions can be set in motion by air currents or stand erect in muscular promise of shifting form. Gracefully, he integrated poetry and science, engineering and art with balance and pattern. All of his art is informed by the artist’s own warm sense of humor. This is often described as whimsical or witty. As you enter the PEM gallery, a large gracefully poetic shadow greets you. This appealing silhouette of a large mobile sets the poetic tone for the whole exhibition. Then the exhibit follows a path to and through individual sculptures and thoughtfully arranged groupings. The beautiful arrangement of the exhibition space adds serenely to the quality of the viewing experience. Harmoniously, elements and lighting work together to focus the viewing of the artworks. Seeing this great body of work underscores how magnificent Alexander Calder’s artistic output was. High points were placed all through the exhibit. Even though almost every element in the show is embracingly brilliant, several are notable. These pieces include 4 Woods (Diana) created in 1936, an early wooden piece that resembles Arp’s work, an elegantly spiked, undulating floor mounted work Un effet du japonais (1941), the large, elegantly whimsical large mobile Little Face (1962), the fragile-looking but brilliantly balanced La Demoiselle (1939), the largest piece in the show, La Grande Vitesse, an intermediate sized stabile maquette, that was created in 1969 for his iconic NEA commission in Grand Rapids, Michigan, and the exquisite maquette for Storm King’s Southern Cross (1963). And there are many more as well. 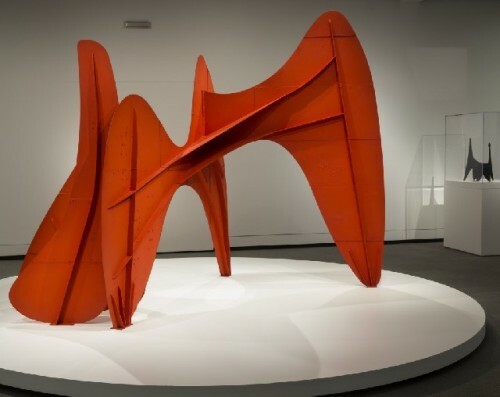 Alexander Calder literally changed the nature of sculpture. And more importantly, he changed the way people perceive sculpture. He did this by imbuing the three dimensional form with a poetic spatial aspect that speaks to materiality and immateriality, present and future time, subtle and substantial motion and visceral and personal awareness. His large body of work is serious art underscoring a sense of intelligent wit. Calder and Abstraction:From Avant-Garde to Iconic is a special exhibition. It displays the work of a master whose technical ability went hand and hand with his creativity and originality. Elegantly beautiful and visually embracing, this is a show to smilingly absorb and cherish. This article is republished by permission of ARTES MAGAZINE.